"You know when I was a kid, if I hurt my ankle playing outside, my mom would just throw a bag of peas on it." "But now, we as a society seek instant gratification, instant relief, and we turn to opioids to find it." The issue that haunts him the most? The opioid epidemic that’s been plaguing communities in Pennsylvania for years.The issue that haunts him the most? The opioid epidemic that’s been plaguing communities in Pennsylvania for years. 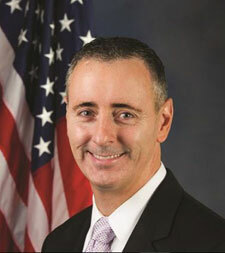 At the early Tuesday morning meeting, Congressman Fitzpatrick was introduced incorrectly by his brother’s name but took it in stride with a giggle saying, "It happens more often than you think, I used to it by now." Congressman Fitzpatrick admitted, "This isn’t an easy battle, there’s people that aren’t interested in financing the solution, they don’t want to make the investment." Fitzpatrick then went on to say, "But I don’t think money should be an issue, you can’t put a cost on human life." As to how Fitzpatrick wants to "stop the bleeding" with the opioid epidemic, he said he wants to start with the education our schools provide on the matter of drugs, drug addiction, and mental health. "Let’s start early, we don’t spend enough time educating about mental health and warning our children just how dangerous these prescription drugs are." "There’s a stigma around here that’s attached to drugs like heroin, but the minute these kids can’t afford to get their prescription pills, they turn to the cheaper option. Even though kids think they’ll never sink that low, we still need to educate them in case they ever do." "I was visiting the Bensalem police department the other day and a drug bust they just did wiped out almost all of their already tight budget," Fitzpatrick said. Fitzpatrick, who serves on the House Committee of Homeland Security and was also a special agent in the FBI that fought political corruption and helped in global counterterrorism efforts, warned the crowd about breaches in cyber security saying, "Cyber security is by far the greatest security risk we face." "In the age of terrorism where physical acts of terror are being committed, people downplay the harshness of cyber security, but don’t be fooled, a breech on cyber security can cut a democracy off at its knees and destroy an economy." Fitzpatrick warned. Fitzpatrick then ended with school safety, reminding the crowd that "there is no higher priority we have as parents than to protect our kids." "My personal view is that if we don’t talk, then we can’t fix anything. That’s why I’m part of the Problem Solvers Caucus." "No one party has a monopoly in good ideas, we need to listen to each other in order to act and make change. We need to come up with the best solution regardless of party affiliation." When audience members asked how we as citizens can help, Fitzpatrick urged them to visit his office in D.C., saying "I’d much rather see you guys down there than the people I normally have to see."